EuroBolt manufacture high integrity and quality fasteners creating solutions for each individual customer. Eurobolt provides our valued customers with the most effective designing, engineering and manufacturing solutions to meet their most demanding applications. 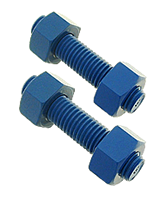 Our main objective is to continuously exceed our customer's expectations by providing them with high performance bolting products, competitive pricing, on-time delivery and exceptional customer service. EuroBolt Fastening Solutions is a manufacturer and stock holder for all sizes of SAE, ASTM and ISO fasteners including stud-bolts, nuts, bolts, cap-screws, engineers studs and all thread fasteners in a variety of grades, alloys and coatings.